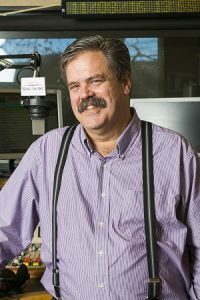 Bryan LoweKING FM 98.1 - Classic Radio Inc. | KING FM 98.1 - Classic Radio Inc.
Bryan Lowe has lived in the Pacific NW his entire life, coming from a family of musicians, including a sister who, until her recent retirement, played in the Pacific NW Ballet Orchestra. His brother is a bass player, touring internationally with jazz and rock ensembles. His family radio station when he was young? KING FM. Bryan played French horn in many local groups including Seattle Youth Symphony, Bellevue Philharmonic, and Seattle Philharmonic. He attended Cornish and was a Gold Medal performer with the Seattle Symphony under Milton Katims. His goal since childhood was to become an announcer at KING FM. As a child he “practiced” being a KING FM announcer with a toy broadcast kit, and was active as a classical announcer at his high school radio station and at the public station at Washington State University in Pullman. He started at KING FM after graduation in 1979. Since 1996 Bryan has been instrumental in the development of KING FM’s website and online broadcast channels. He became Program and New Media Director in 2006. His favorite composers are Messiaen, Janacek, and Prokofiev, though he also enjoys Chopin and R. Strauss. Bryan has built several boats and uses them with his wife and two children in the sloughs and rivers of the Northwest. He is involved in youth programs at Mercer Island High School and is on the board of the WMEA Young Musicians Excelling Program. Stunningly Powerful Pieces You May Not Know But That You Must Hear at Least Once in Your Lifetime – a Playlist – There are SO MANY great pieces of classical music we know you’d love. But here are my choices for pieces outside the top 30 or so that are amazingly powerful, each in their own way, from the profound to the miraculously beautiful. For more than 37 years so far, I’ve had the honor of talking with people about their love of classical music. It’s a beautiful part of my job here. Hardly a week has gone by that I don’t meet someone, get an email or phone call and hear an amazingly touching story about what classical music means to them or someone they loved. For many there are certain pieces that remind them of a parent long gone, or a piece that opened their eyes and ears to the wonders of classical music. Sometimes there are tears in the retelling, but there is always absolute joy, as well. This is such wonderful music, something we share as we listen, be it with family or with thousands of fellow KING FM listeners. This is music that means something, music that’s important to us, and it’s music worth supporting. Today. Please donate now, gifts of any size make a difference.